Congratulations to Alex Ericson and Isaac Pendleton, March's recipients of the HMS/Rotary Student Recognition award! The Unified Arts Team chose Isaac for this recognition and the 7th Grade Team chose Alex. This recognition is based on growth mindset and the effort/grit/perseverance demonstrated by HMS students. Alex’s teachers shared that they selected her for this honor because of her incredible work ethic, positive attitude, and exemplary growth mindset in the classroom. Alex demonstrates nothing less than her best effort at all times. As a learner, she is constantly growing and often seeks feedback for direction. Furthermore, she is highly motivated and is a thoughtful, independent worker. As Alex's teachers, we enjoy her presence in the classroom as her curiosity and pursuit of excellence has no limits! Isaac’s teachers shared that he has excellent leadership skills, which are accompanied by a great sense of humor. He helps set a positive tone and atmosphere for his classmates and always works to the best of his ability. Isaac is also a great resource on math team and supports his group during math challenges. His cheerful and persistent approach to math challenges is infectious. Isaac’s advisor noted that he is a kind, thoughtful and polite young man who always looks for the good in people. He has great sense of humor and is a wonderful chef! Isaac is also a wonderful singer and musician and an even more wonderful human being. He consistently demonstrates kindness, humor, and an amazing work ethic. The world could use a LOT more Isaac's." 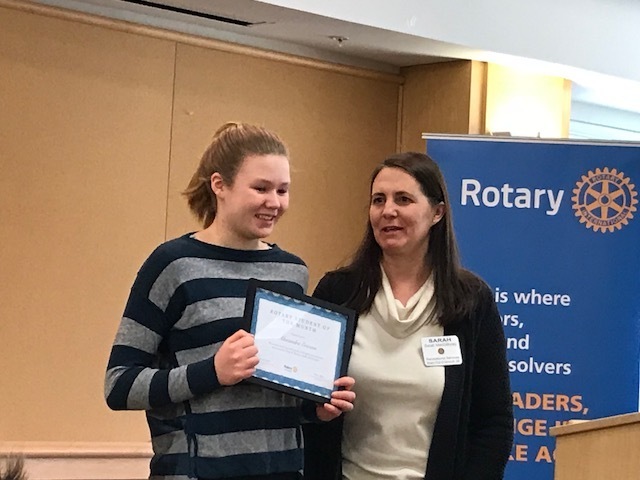 Our heartfelt thanks to Sarah MacGillivray, past president of the Yarmouth Rotary, Bruce Myers, current president, and all members of the Rotary, for partnering with us to make this program possible!